This is actually a review of the restaurant Olsen, a Scandinavian joint located in Palermo Soho in Buenos Aires, Argentina. Our massive purchase of American carbs this last weekend further fueled a desire for more comfort food, so we went to the Western-style brunch at Olsen (this was our second trip) on Sunday. Onto the food. Tom and I both had eggs. My scrambled eggs were super runny, so if you don’t like them that way, be sure to tell the waitstaff. The omelet, on the other hand, was quite dry and very bland. We also both had the homemade yogurt that is served with cereales. They aren’t kidding…it wasn’t really a granola on the top, but rather a bad corn flake. Under that layer, was a sickly-sweet fruit-based syrup. By the time we tunneled through the top two layers, we had no idea what the homemade yogurt tasted like since it had become defiled by the super sweet and the blandly crunchy! 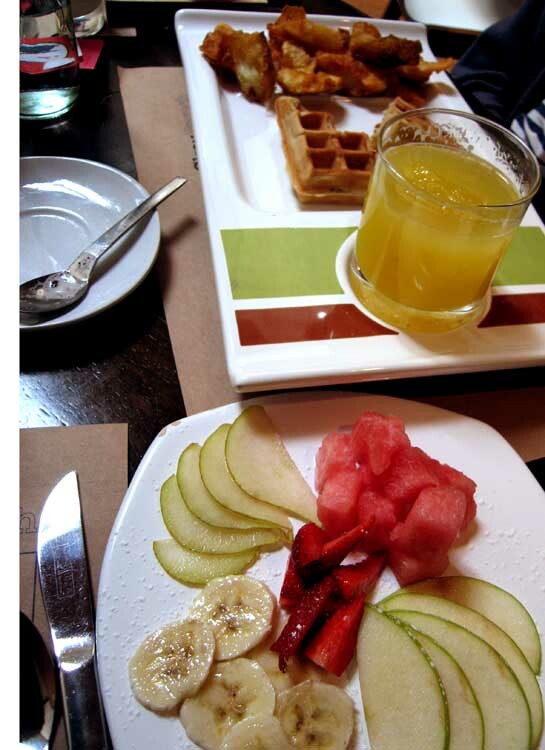 The girls ordered the waffles, which were a bit cakey, but were produced with a pleasantly sweetened batter. A flaw though — these corrugated carbs do not come with butter, jam, or syrup, so if you want something with which to garnish your gridded grains, you will need to ask. Their fruit salad was nice as well, the produce all tasted good and was appropriately ripe. Which brings me to the deep fried potatoes — those were universally popular at the table. 4, or I guess that’s 8, thumbs up. In short, the experience and ambience are great, but we felt the execution on the food fell short. This entry was posted on Monday, May 18th, 2009 at 7:03 pm. You can follow any responses to this entry through the RSS 2.0 feed. You can leave a response, or trackback from your own site. I like Olsen, but the best thing about it is the variety of vodka cocktails! — so rare here in BsAs. We just wanted some well-executed ham/sausage/bacon/egg/waffle/pancake sort of brunch idea, but perhaps I would have enjoyed Olsen more if I had gone straight to the Vodka cocktails! Actually, I’m trying to picture myself having a drink with brunch and I believe I would have face planted in my food!! I’m old and I need a lot of sleep, there, I said it.